A képre történő kattintás után megtekinthet minden rendelkezésre álló fotót a (az) El Chañar-hoz. 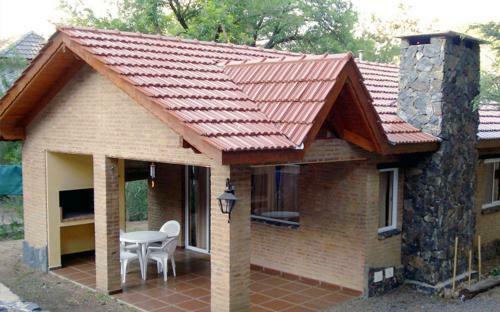 Offering a garden and seasonal outdoor pool, El Chañar is located in Villa General Belgrano. Santa Rosa de Calamuchita is 9 km away. All units are air conditioned and feature a seating area with a flat-screen TV and DVD player Some units include a terrace and/or balcony. All units have a kitchenette fitted with a microwave and fridge. There is a private bathroom with a bath or shower and free toiletries in every unit. Towels are featured. El Chañar also includes a barbecue. La Cumbrecita is 23 km from El Chañar. Please note the based on local tax laws, all Argentinian citizens and resident foreigners must pay an additional fee (VAT) of 21%. Only foreigners who pay with a foreign credit card, debit card or via bank transfer are exempt from this 21% additional fee (VAT) in accommodation and breakfast when presenting a foreign passport or a foreign ID along with a supporting document handed by the national migrations authority, if applicable. Please inform El Chañar in advance of your expected arrival time. You can use the Special Requests box when booking, or contact the property directly with the contact details provided in your confirmation. Payment before arrival via bank transfer is required. The property will contact you after you book to provide instructions.